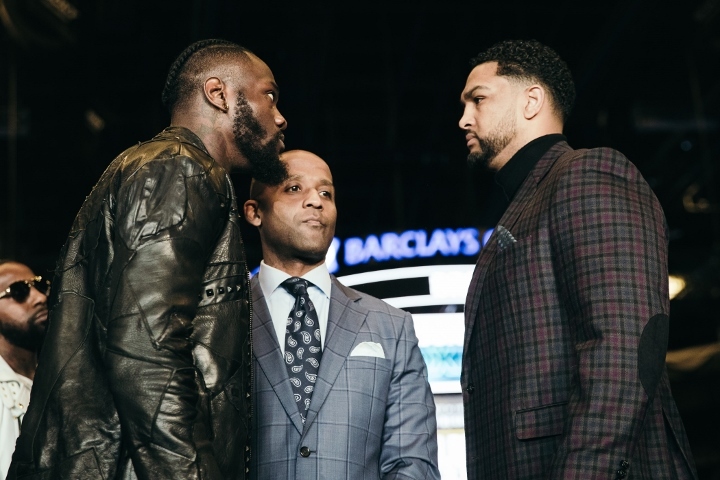 On the surface, Deontay Wilder’s upcoming showdown with Dominic Breazeale appears to be just another routine mandatory title defense. Their history, however, has this one cutting much deeper. Bad blood has existed from the moment their camps threw down in a Westin hotel lobby in downtown Birmingham (Ala.) after having appeared on the same Fox card earlier that Feb. ’17 evening. A lawsuit followed by Breazeale, claiming he was assaulted by Wilder’s brother, with the case eventually thrown out of court but his status as a future title challenger solidified on a yet another show on which they appeared together—but in separate bouts—later that year. Breazeale (20-1, 18KOs) will finally have his say in the ring, as he enters his first career title fight in their May 18 clash at Barclays Center in Brooklyn, New York. For Wilder, it will mark his 10th appearance under the Showtime umbrella in his last 13 starts. Four of the bouts—including his forthcoming battle with Breazeale—have involved the Barclays Center, with each previous encounter all ending in knockout. “It’s a pleasure to be here at the Barclays Center,” Wilder noted during a press conference held on site Tuesday afternoon. “I’ve been here so many times before; I’m known as the Bronze Bomber, but here in Brooklyn they call me the ‘Bronx Bomber’, to make that connection (as an adopted New Yorker). Wilder’s debut at Barclays came in Jan. ’16, turning a competitive fight with previously unbeaten Artur Szpilka into a highlight reel 9th round knockout. Three fights later came his Nov. ’17 rematch with Bermane Stiverne, from whom he annexed the heavyweight title in their Jan. ’15 clash on Showtime. Stiverne was the lone boxer Wilder had faced whom managed to hear the final bell to that point. That changed in a big way in their sequel, with the defending champ scoring three knockdowns in a violent 1st round knockout win. Wilder’s most recent appearance at Barclays came last March, surviving a Fight of the Year candidate with Luis Ortiz to stop the previously unbeaten southpaw contender in 10 rounds. Breazeale has also never heard the scorecards read in his previous Barclays appearances. The 2012 U.S. Olympian from California will fight for the third straight time at the venue, having stopped Eric Molina in the 8th round of their Nov. ’17 title eliminator—on the undercard of Wilder-Stiverne II—and most recently earning a 9th round knockout win over Carlos Negron last December. It was believed that Breazeale would have to wait at least one fight longer for a grudge match with Wilder, who was in talks with Tyson Fury for a rematch to their thrilling 12-round draw last December. While details for such a sequel were ongoing, Breazeale and adviser Al Haymon were negotiating an interim title fight with England’s Dillian Whyte. Everyone’s world changed in a big way when Fury (27-0-1, 19KOs) announced his having signed with Top Rank and ESPN, thus severely disrupting what was thought to be dangerously close to a done deal for a Wilder rematch. Once the fight was killed altogether, it meant Wilder having to honor his mandatory obligation—and for said contender to get his chance to finally shut the mouth of the long-reigning titlist. "I'm sick of hearing your voice,” stated Breazeale, who will work with noted trainer Virgil Hunter for his first career title fight. “You love to hear yourself talk, I'm just looking to fight, one on one, mano y mano. Naturally, the defending titlist envisions a very different outcome. “I feel more intense right now than I did for the Bermane fight,” Wilder insists, speaking to the pent-up anger from the past two years. “I can’t wait. I’m not gonna speak… I’m just gonna show. I’m ready. I’m always ready. As a champ you always want to stay ready. You have contenders you have guys coming for your crown.